The deformation of round tube into an elliptical shape; symmetrical flattening of a round tube; a measure of the difference between the maximum and minimum outside diameters of a round tube. Ovality is not a form of bend reduction, which is flattening of a tube’s outside radius as result of the bending process. In contrast, ovality is a deviation of a tube from an ideal round shape caused by imperfection during milling or flattening from storage. 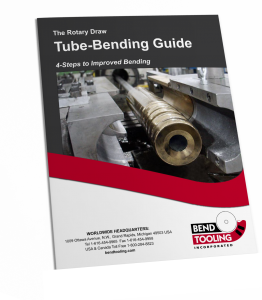 This is a printable handbook showing how to implement in four standardized steps the “forward mandrel” set-up for rotary-draw tube-bending machines and establish process control over the so-called black art. The procedure is based upon the guiding principle that the tools make the bend and takes advantage of the inserted design of modern mandrel tooling.